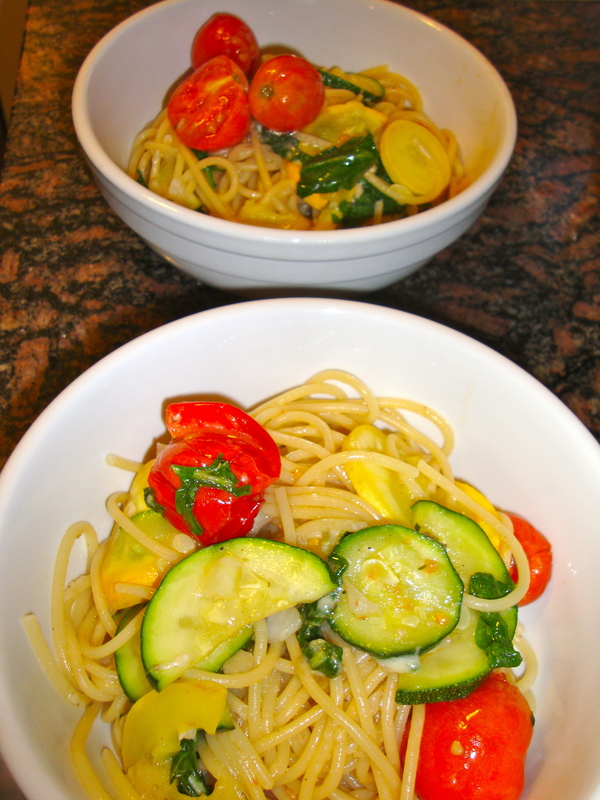 Inspired by my friend Megan’s gift of a fresh zucchini from her garden (jealous! 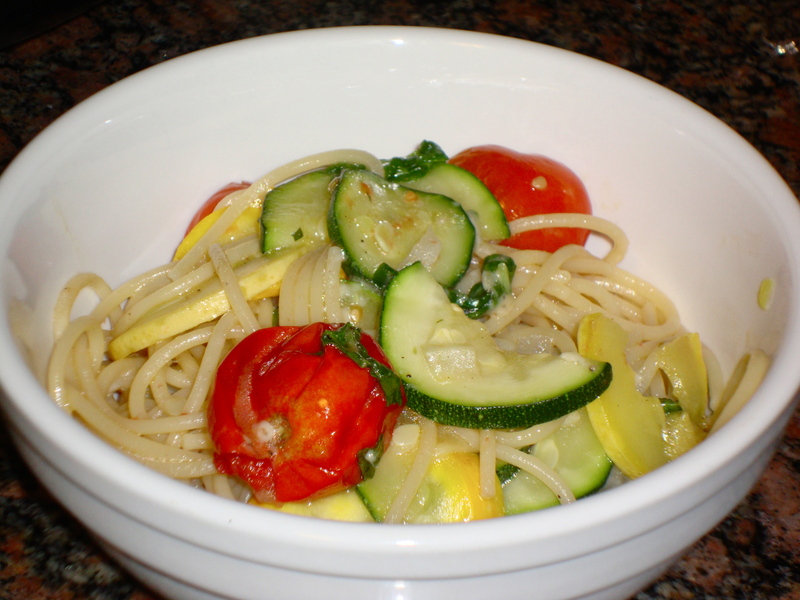 ), I found this Tyler Florence recipe for Spaghetti with Summer Squash and Tomatoes and hit the farmer’s market for some more super fresh produce to round out the dish. Oh boy, was it worth it. This pasta is light and fresh, and bursting with great flavors from the veggies — and the fresher you go, the better this will taste. I even got some arugula from the farmer’s market and it was unbelievable — spicy, peppery and the perfect hit in this tasty bowl of pasta. 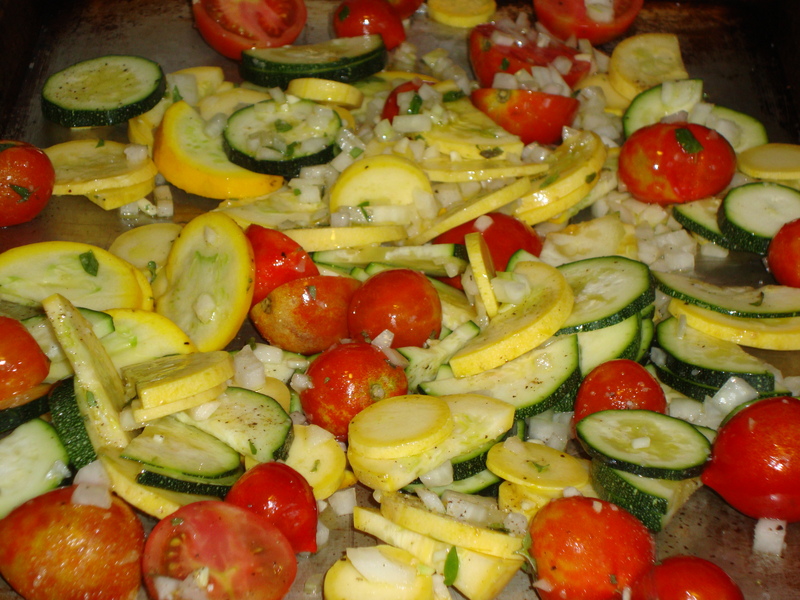 Roasting all the vegetables instead of sautéing really make a difference in this recipe. The roasting caramelizes the veggies and also adds more of a nutty taste to them — so much better than a turn in a frying pan, even if it does take a little longer. 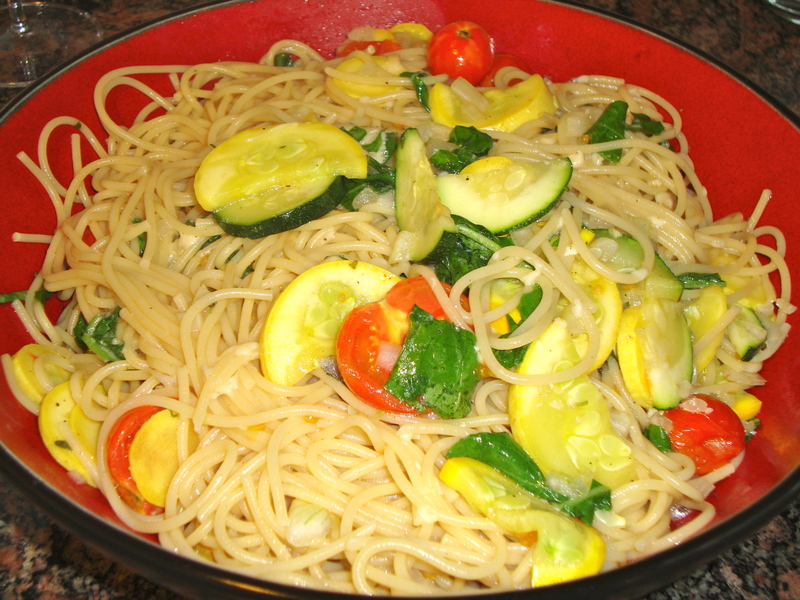 There are so many vegetables in here that you don’t even feel bad about eating a bowl of pasta! 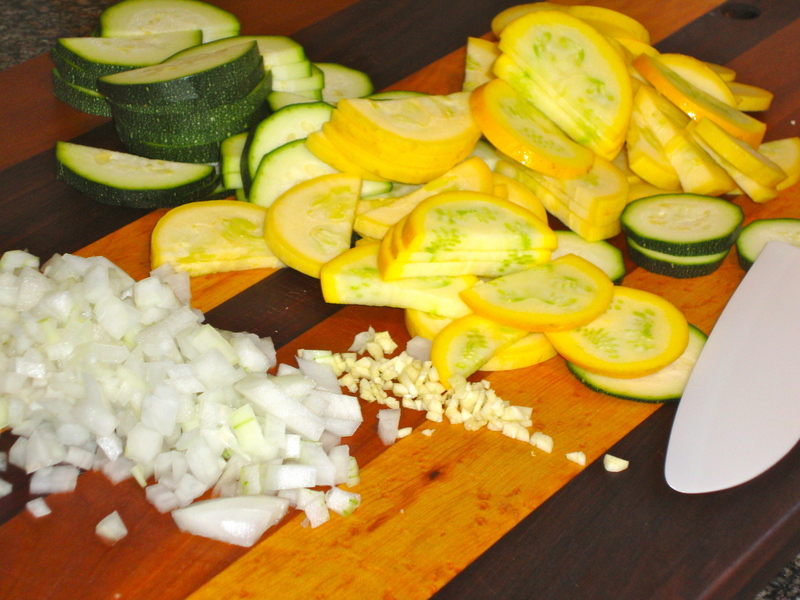 Use fresh farmer’s market veggies. Go super al dente on the pasta — I love when pasta has some bite to it, and it makes this even better reheated. Don’t forget the ladle of pasta liquid before you drain! Use lots of fresh cracked black pepper on top, and sprinkle with a little sea salt/kosher salt. Yum! To finish, scoop out about 1/4 cup of the pasta cooking water, drain the pasta, and toss gently with the roasted vegetables. Add the pasta water if needed. Toss with the arugula and Parmigiano-Reggiano. 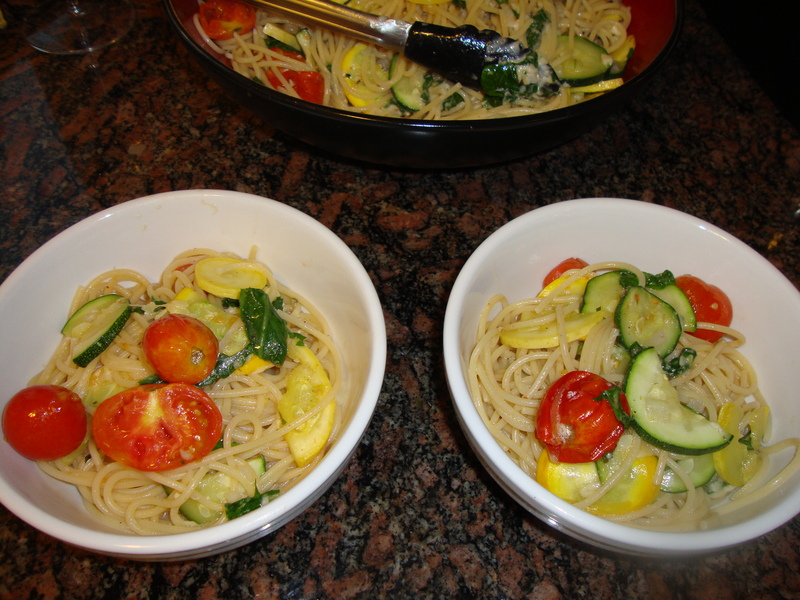 This entry was posted in Recipes, Uncategorized and tagged arugula, pasta, summer squash, tomato, Tyler Florence, vegetarian, zucchini by Tricia. Bookmark the permalink.